Warner Bros drops new Hobbit film titles and dates! 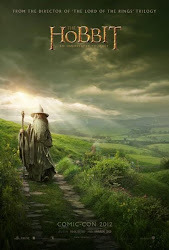 Hollywood Reporter and various other outlets are reporting that July 18, 2014 will be the release date for the third Hobbit film. In addition, they report that Warner Bros has announced that the third film will be renamed The Hobbit: There And Back Again. The second film, to be released on December 13, 2013 will be called The Hobbit: The Desolation of Smaug. EDIT: I think that the second title Desolation of Smaug means that it will conclude with the demise of Smaug at the hands of Bard the Bowman. Highlight to see spoilery speculation.